It's difficult to process a whole offseason’s worth of data before fantasy draft day. Players have changed teams, teams have changed coaches, and coaches have changed game plans. But have no fear, the Fantasy Footballers are here with their draft preparation package: the Ultimate Draft Kit. In this Ultimate Draft Kit review, I'll break down the usability of their draft tools, the pros and cons of this service as a whole, and whether this draft kit is worth the price of admission. I'll also examine the most innovative features of their tool suite, including the Red Zone Report and Reception Perception analysis. The Ultimate Draft Kit is a suite of fantasy football tools that provide seasonal players with high-quality, actionable advice for their fantasy draft. This is not a basic set of pre-draft player rankings and projections. The Ultimate Draft Kit goes deeper, way deeper. The UDK includes video profile reviews of the top players at every position, a variety of cheat sheets for multiple league types, and insightful metrics to help you develop a sound fantasy football draft strategy. Right now you can get full access to the UDK for only $24.99. Every draft preparation tool that you'd expect from a paid service, plus unique features that will give you that all-important edge. Easily-digestible tables, charts, videos, and podcasts that accommodate any player’s learning style. Goes beyond simple stats to deliver actionable metrics that help seasonal players find useful statistical nuggets. Definitely worth its pre-draft $29.99 price tag, but loses its usefulness after draft day. Get in early to get the most value. A team of analysts and advisers called the Fantasy Footballers created the Ultimate Draft Kit. These guys are a well-regarded group that has built up a loyal following of fantasy heads that they call the Foot Clan (you can become one here). Want proof that these guys are generous with their fantasy advice? In 2018 they held a contest where they gave away the Ultimate Draft Kit for life (along with some other cool prizes). 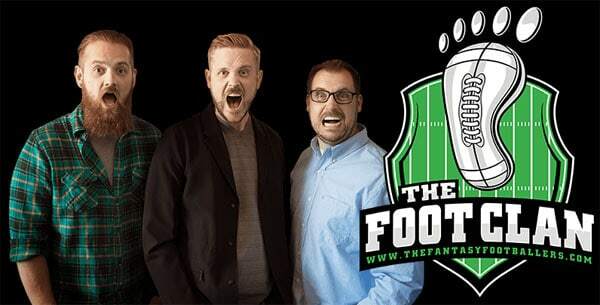 ​​​​​​The Fantasy Footballers have two separate weekly podcasts, one about fantasy in general and one geared specifically toward DFS players. They also publish weekly reports, analysis, and rankings for fantasy players of all stripes. While there is plenty of DFS content on their site (check out their Ultimate DFS Pass), the Ultimate Draft Kit focuses solely on seasonal leagues. I will point out that the data provided in the Ultimate Draft Kit is not for everyone. If you’re the type of guy who checks his lineup once a week to make sure that no one is on a bye, then their free rankings and content should be sufficient. But if you’re a like me, and you love nothing better than deep and actionable fantasy data, then you may be about to enter stats nirvana. The UDK offers an impressive selection of advanced metrics that you won’t find anywhere else. The stats in the UDK take you inside the match-ups, maps player performance against different types of defense, and help you see which players are great versus those that just had a great season. Overall, few products compare to both the breadth and depth of the data that the Ultimate Draft Kit provides. At $29.99 per season, the Ultimate Draft Kit is about average compared to other pre-season kits. There are indeed less expensive options out there, but most do not provide the statistical depth and range of content that the Fantasy Footballers deliver. This Ultimate Draft Kit review will cover a few of these unique tools in detail. Unfortunately, the Fantasy Footballers does not offer an Ultimate Draft Kit coupon code. However, right now they're running an early bird special whereby you can save 15% by pre-ordering the 2019 package. Also, if you play in both seasonal and DFS leagues, you can save 25% by bundling the UDK with their Ultimate DFS Pass suite of daily fantasy research tools. The Ultimate Draft Kit has all the standard tools that you would expect from fantasy football draft software, plus many other features that help it stand out from the crowd. But even their standard features offer a depth that differentiates them from similar packages. If you're looking for ways to spice-up your fantasy league draft, I wrote another article detailing clever ways to determine fantasy football draft order. The actionable info contained in the Ultimate Draft Kit will transform your fantasy football draft boards into an empty canvas on which to imprint your fantasy legacy. Let's take a look at some of these tools in detail next. They also offer tiered rankings to help give you a handle on a player’s relative value compared to other players, as well as non-tiered rankings that show you the big picture. Whether you prefer your info in audio, video, textual, or graphical form, the Fantasy Footballers have you covered. The team is well-known for the weekly podcasts that they produce. But that is just one pillar of their content offerings. The Ultimate Draft Kit contains video breakdowns of the most relevant players at every position. I love these because I can listen to them while driving or doing a workout. The videos feature internal debates between the Fantasy Footballers take a hard look at players based on a variety of factors. Typical points of analysis include not only a player’s basic numbers but also their match-ups, past performance, consistency, and projected value. The video below is a typical example of the type of player evaluation you'll get in the Ultimate Draft Kit. Here they discuss Kirk Cousins. These profiles are perfect for folks that prefer dynamic content to spreadsheet data. For those that do love a good data array, there's also plenty of that. Want to go even further down the wide receiver rabbit hole? Their Reception Perception package has stats like receptions in space, broken tackles, and target shares - stats that I’ve never seen on any free stats or advice site. Some of the top fantasy football books promote stacking your team with wide receivers early in a draft. Reception Perception metrics can help you prioritize your target wide receivers if you employ strategy. Another useful feature that you’ll find in the Ultimate Draft Kit is consistency metrics for every fantasy position. These show you how often a given player has ended up in the top, middle, or bottom tiers at their position from last season, previous years, or on average through the last two or three years. This info helps you understand which players are consistent on a week-to-week basis and which ones may have their numbers inflated up by some boom weeks against lesser opponents. Knowing this can help ensure that you don’t draft flash-in-the-pan players that are unlikely to put up the same numbers that they did last season (they've likely hit their ceiling). Their Red Zone Report is a great way to track the likelihood of scoring those all-important touchdowns for any given player on any given week. The reports show not only how likely a player is to score once they get inside the twenties, but also more refined stats like how often they're likely to get touches inside the 10 or 5-yard line. It doesn’t take a fantasy genius to pick a great player in the first round. The ability to spot productive talent in the later rounds is what separates league champs from league chumps. If you're looking for some cool ways to recognize your league champ, check out my review of Fantasy Jocks. They sell trophies, belts, rings, draft boards, and more at excellent prices. To this end, the Ultimate Draft Kit offers some pre-season lists that can help you identify breakouts, busts, sleepers, and value picks. Breakouts are those players that are poised to become superstars, even though they may not have the track record of your Julio Joneses or Antonio Browns. Sharp eyes will note that they picked Patrick Mahomes as a breakout candidate for 2018. I guess you could call this a solid prediction, given that he currently leads all fantasy players in points right now (though the jury is still out on their Mariota pick). On the other side of the coin are the potential busts, because nothing can tank a team like spending a high pick on a player that doesn’t produce. Bust picks at QB for 2018 included Carson Wentz, who at the time of this writing is ranked 21st in fantasy points at his position, and the ill-fated Jimmy Garappolo. They also picked Derrick Henry as a bust at RB - some info I really could have used before drafting him to multiple teams this season. He is no longer on any of those teams, given that he’s cracked the 10-point mark precisely once this season. One area of fantasy football that gets consistently under-served is dynasty leagues. I love a good keeper league, but they are by far less common than seasonal redraft leagues. Unfortunately, this means that many sites don’t put much effort into offering dynasty advice. The Ultimate Draft Kit, on the other hand, has its own set of rankings solely for dynasty leagues. Tom Brady and Drew Brees have dominated the quarterback position for the last decade. However, they certainly wouldn’t be your top pick going forward into the next ten years, would they? They even have a separate list specifically for rookies in keeper leagues, helping you buy low before a player’s stock is super high. The top rookie on that list for 2017? Saquon Barkley, the New York Giants running back who currently happens to lead all rookies in scoring. Every year they add a few new features to the Ultimate Draft Kit. In 2019, they're increasing the flexibility and accessibility of their draft kit. Custom League Scoring - Player projections are only useful if they're adjusted for your league's scoring configurations. In 2019, it's easier to create stat projections based on your custom scoring rules. The UDK Mobile App - In 2019, you can get fast access to the best Ultimate Draft Kit features on mobile. I spent quite a bit of time experimenting with the Ultimate Draft Kit in preparation for writing this review. But why trust my opinion when you can look to the masses? Prepping effectively for your draft is perhaps the most significant factor in having a successful fantasy season. You’d be hard pressed to find another advice site that helps you prep better than the Fantasy Footballers and their Ultimate Draft Kit. In this Ultimate Draft Kit review, I covered a small subset of the unique seasonal tools designed to give you an edge on draft day. There are many, many more available to those that purchase a subscription. Forget dominating the league that you and your college buddies play in each year. These are tools that can help you slay even the scariest fantasy monsters in the game... or become one yourself.